Guests who are in the area for Thanksgiving will be in a prime location for another highly anticipated annual event: Black Friday. Shopping enthusiasts will have plenty of great options in the area, from malls and outlet stores to all of your favorite national retailers. Many venues are opening the door on Thanksgiving night to give enthusiastic shoppers an early start. If you are wondering where you can go to find the best Black Friday deals in Myrtle Beach – look no farther! Here is our run down of where to go for great Black Friday shopping in Myrtle Beach. Coastal Grand Mall offers over 100 retailers for you to choose from! From high end fashion retailers to home furnishings and popular department stores – you are sure to find everything in one spot at Coastal Grand Mall! The Market Common is an outdoor venue that boasts an eclectic variety of upscale retailers. Here, you can find brands like Anthropologie, White House | Black Market, Williams-Sonoma, Pottery Barn, and more. There are also plenty of places for you to grab a bite to eat and refuel in between store hopping in addition to a movie theater for others in the group to enjoy. Located just inside North Myrtle Beach, Barefoot Landing offers a diverse array of quaint local shops and well known national vendors. Find unique gifts that can’t be found anywhere else then hop over to your favorite retailer to find great bargains. 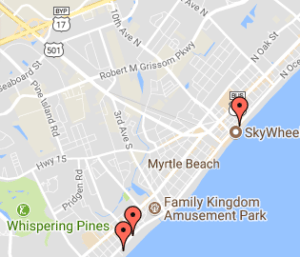 Conveniently located in the heart of Myrtle Beach, Broadway at the Beach offers over 75 stores where you can find just about anything you are looking for. From jewelry and attire to home furnishings and toys, Broadway offers it all! In addition, there are plenty of attractions and restaurants for you to enjoy after you have shopped ‘til you drop. Located south of Myrtle Beach, Inlet Square Mall is the perfect place for both shoppers and their families. The shoppers will enjoy the diverse array of clothing, toy, book, and home furnishing retailers while the rest of the group will enjoy the movie theater, bowling alley, and arcade! With two convenient locations and the best bargains in town, you don’t have a reason not to stop by one of the area’s two Tanger Outlet locations. The Tanger Outlets offer huge discounts on national brands and this Black Friday they are slashing prices even further! Get there early, as there are sure to be crowds. This popular national retailer always attractions millions each Black Friday – and for good reason! Find great deals on electronics, toys, apparel, home furnishings, and so much more. With two locations in Myrtle Beach, you won’t have to drive far to get to this popular national retailer. They are opening early this year to accommodate the crowds so be sure to stop by and save on your holiday shopping! Find great deals on clothing, accessories, electronics, toys, and more! If you are looking for a break from the hustle and bustle of Myrtle Beach, take a trip south and check out the Murrells Inlet MarshWalk. Located in the quiet seaside town of Murrells Inlet, this oceanfront boardwalk features eight unique restaurants and a lively marina where you can have some fun on the water. The MarshWalk is the perfect place to bring the family for a day full of fun or to enjoy a night out on the town. Crazy Sister Marina is where guests can enjoy a wide array of wet and wild fun. Rent a boat and enjoy a relaxing day cruising the marsh or get a few jet skis to catch air on the ocean waves. Fans of fishing can take a private charter out for the day or book a seat on the Inlet Princess where you can try your hand at catching dinner. Those on a budget can still have fun; Crazy Sister also offers kayak and paddle board rentals which still allow you to have fun in the sun without the sticker price of a full boat rental. If you have younger children in the group, check out the Pirate Adventure Ship where you can enjoy a tour of the inlet and help the captain ward off intruders. After a busy day out on the water, take a break and refuel at one of the MarshWalk restaurants. There are eight different restaurants along the MarshWalk, all of which channel a distinctive low country flare while still offering something unique. Bovine’s is famous for their wood fired pizzas and juicy steaks. Next door, Wahoo’s offers fresh seafood and fast, affordable sushi. Dead Dog Saloon is known for their generous seafood baskets and expansive outdoor seating patio while Wicked Tuna offers fresh seafood with an Asian flare. All of the restaurants are connected via an inlet front boardwalk, making it easy to enjoy a scenic walk after dinner. Most of the restaurants keep things going well in to the night with live music and drink specials, so stick around for some late night fun! The Murrells Inlet MarshWalk is the perfect place to go for a break from the hustle and bustle of Myrtle Beach. The slower pace and scenic views set the tone for a relaxing afternoon. Get into a little wet and wild fun at the marina or enjoy a night out on the town at the inlet front bars and restaurants. Perfect for families or couples, the MarshWalk is sure to be a memorable part of your next Myrtle Beach vacation!